Hello! I hope you have had a wonderful Christmas and are ready for an even better year ahead! 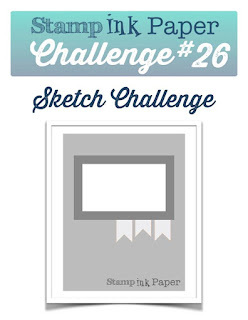 This week over at Stamp, Ink, Paper we have a challenge that couldn't be easier. Are you ready... it's Anything But Christmas! How awesome is that! 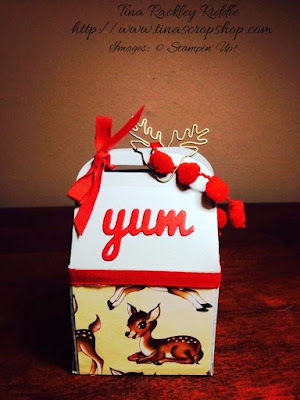 I used some of the Stampin' Up! Background DSP in Pool Party for the polka dot layer and then did some paper piecing of her dress in the same DSP. I also used some MFT stitched rounded rectangle dies for my layers. 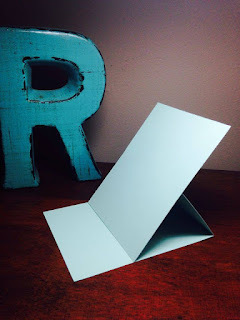 For my A2 Daffodil Delight Card Base, I used a corner chomper to round the corners of my card to match (somewhat, anyway) the rounded corners of the rectangles. 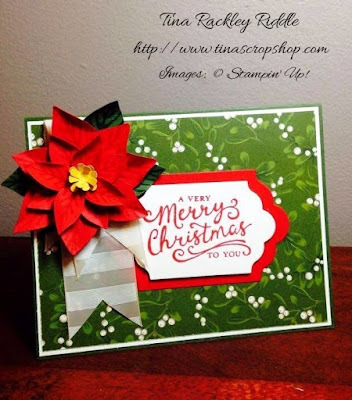 Hello and welcome to Stampin Friends December Blog Hop! If you've already been hopping along you should have landed here from my friend Andrea Tracy Tucker's fabulous blog! If you happened to have missed it, just click the previous button and you'll be there! This month we are super excited to have 3 awesome guest hoppers! 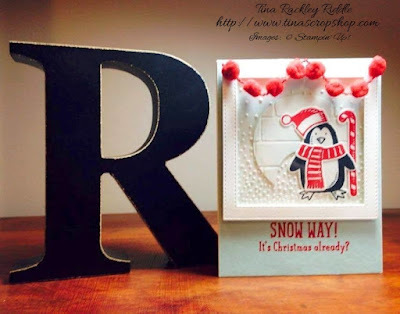 I have been having so much fun playing with these Snow Place stamp set and the coordinating Snow Friends Framelit Dies. I knew as soon as I saw these that I would "need" them for my granddaughter's Christmas cards. There is just no way to make a card with these that isn't adorable! For my project I wanted to make a cute little container to hold some "Reindeer Chow"
Also, as you are hopping along today, you will notice this banner along the way! So make sure that you get the needed detail from every hopper and email for your chance to win big! And by the way, my favorite holiday is indeed Christmas! Yay, we're almost there! Thank you sooo much for stopping by! 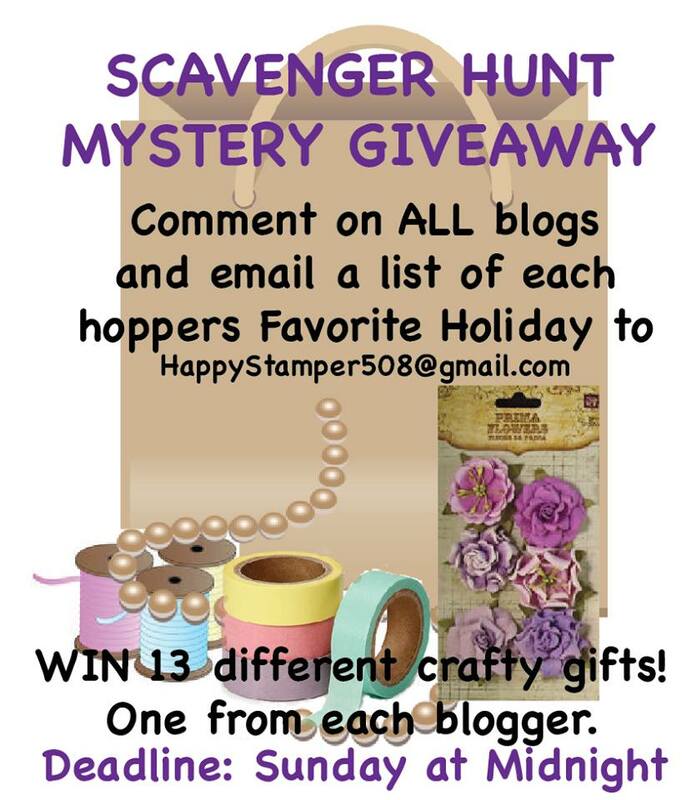 Again, make sure you get my favorite holiday....Christmas, and follow the directions on the Scavenger Hunt banner for your chance to win big! Next up is the very talented Mandy Reedyk. 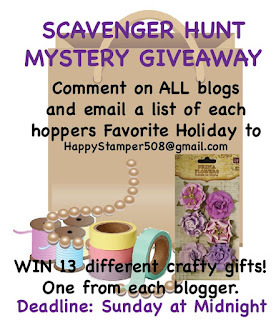 Just click the next button and you'll land at her blog! 13. Tina Riddle - You are here!! http://www.stampinkpaper.comHello and Happy Tuesday! Hopefully your week is off to an awesome start! 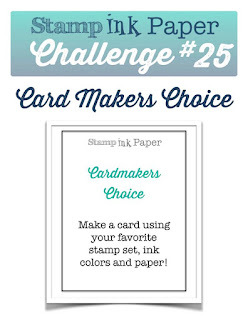 I'm back over at the Stamp, Ink, Paper Challenge Blog with a Thank You Card Challenge today! 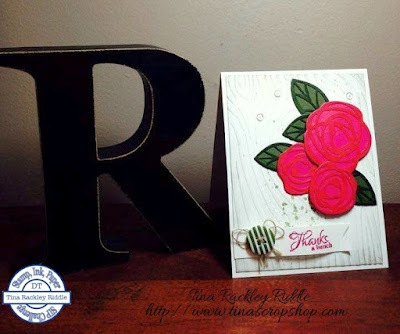 This week I used Ellen Hutson's Bold Blossom dies, a Unity Stamp Company stamp set (for the sentiment) and Stampin' Up! Cardstock and Ink. Yep.. I was all over the place this week! I started with a 4 1/2 " 11' piece of Thick Whisper White Cardstock scored at 5 1/2". My next layer was another piece of Thick Whisper White that had been embossed with a woodgrain embossing folder. Basic Gray Ink was sponged along the edges of the woodgrain layer before adhering to the base with Multipurpose Liquid Glue. I used my aqua painter and Mossy Meadow ink to make some splatters onto the woodgrain background. I cut out the Ellen Hutson Bold Blossoms using Mossy Meadow for the leaves and Melon Mambo for the flowers. After cutting them out, I sponged them with the coordinating ink to make them a bit darker. Once dried I glued the die cuts onto the same color cardstock that they were cut from and then cut them out with my paper snips. I adhered some with multipurpose glue and others with dimensionals. My sentiment from the Unity Bouquet Bunch of Thanks Itty Bitty Stamp Set was stamped with Melon Mambo onto an 1 1/2" wide piece of the Thick Whisper White. The Triple Banner Punch was used to banner cut the end. I used my bone folder to put a wave into the flag and then adhered to my card with glue dots. I added an button from the Home for Christmas Designer Button Collection and threaded it with some linen thread and made a couple of extra loops behind the button before adhering it with more glue dots. Last but not least I added three gorgeous Pretty Pink Posh Dew Drops that I received from my friend, Andrea Tracy-Tucker for my birthday! I love these and must buy more when I use them up! Hello! Hope you are having a wonderful week! It's so hard to believe this year is almost over! 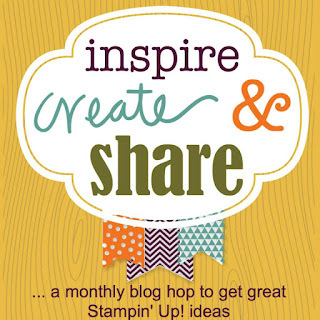 All of the Bloggers at One Stamp At a Time want to thank you for hopping along with us this year! We've had some fantastic hops thanks to some super talented Bloggers and it's been a ton of fun! If you have already been hopping, well then of course you landed here from my friend and partner in crime, Andrea Tracy-Tucker's blog! Isn't she super talented?? I love Andrea's work! Here is my card and project for you, I used some of my favorite sets on these... from Land to Sea, Wetlands, and Traveler. Yep, if you know me at all, you know I LOVE these stamp sets! I had a hard time photographing the sponging well enough that you can see the colors that I used. Here's a close up of the card that is a little better. For my card I started out with a 4 1/4" x 11" piece of Night of Navy cardstock that was scored at 5 1/2" for a top fold card. I layered on a skinny layer of Real Red cardstock that measured 4 1/8" x 5 3/8". My top layer was Whisper White and I started by first stamping the Light House from the From Land to Sea set in Real Red. Once I had the lighthouse in place, I cut some scrap pieces of cardstock to mask off sections for my rolling seaside hills. I masked both the curves of the hills as well as the lighthouse itself. I used Sahara Sand, Crumb Cake, and Chocolate Chip for the hills. Once I had the hills the way I wanted them, I masked them off to sponge on the water in Lost Lagoon. I used a straight piece of cardstock to separate the water from the sky. Once I had the water sponged, I masked the water and sponged the sky. I started with some Blushing Bride closest to the water, and then Soft Sky. I sponged some yellow around the lighthouse to represent the rays of light coming from it. At the top section of the sky and on the sides of the sky, I sponged Night of Navy closest to the edge and some tempting turquoise blended into the Soft Sky. On the bottom of my scene I stamped some Sea Oats from the Wetlands Set in both Crumb Cake and Chocolate Chip. I then tied a piece of 1/2" Real Red Cotton Ribbon across the bottom and tied it in a knot. 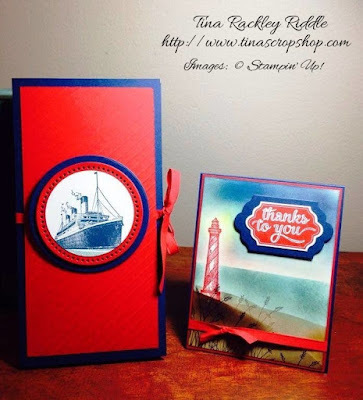 My sentiment from the Happy Notes stamp set was stamped in Red Red Ink on Whisper White cardstock and cut out with the Lots of Labels Framelits Dies. I also cut a larger Lots of Labels Die in Night of Navy for a mat and glued the sentiment on the mat and then adhered the mat with Dimensionals onto the upper right portion of my card. I found an awesome little Lighthouse notepad at Michaels that I thought matched my card so well that I decided to make a cover for it to go along with the card as a gift. The notepad measured 4 x 8" and was 1/4" thick, so my measurements for the cover were 8 3/4" x 8 1/4". I scored the 8 3/4" side on my scoreboard at 4 1/4" and 4 1/2". I used tear tape to adhere my pad to the interior back panel. I then ran a piece of 1/4" cotton ribbon in Real Red and adhered it to my cover with tear tape on the front as well as the back of the cover. My Real Red Panel on the front measured 3 3/4 x 7 3/4". I positioned it in my scoreboard diagonally and scored every 1/2" for some interest to the cover. Over the Real Red Panel, I made a port hole by using circles cut with my Little B Circles Dies in both Night of Navy and Red Red. The Little B Circle Dies are super cool in that they can just cut circles or you can use a separate piece to cut the outer circle as well cut the holes inside the circle. My ship from Traveler was stamped in Night of Navy on Whisper White Cardstock and punched out with a 2 1/2" Circle Punch. 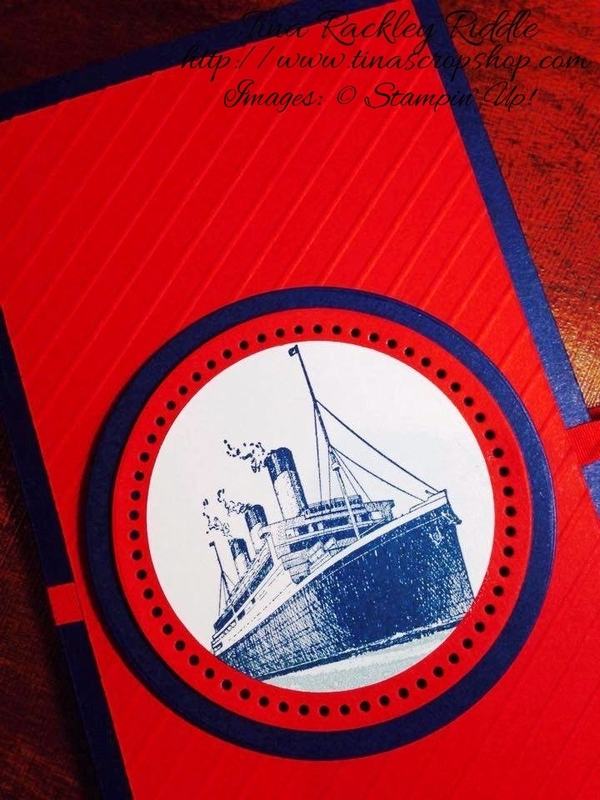 The ship circle was adhered with multipurpose glue onto the Red Circle, and the Red Circle was adhered with dimensionals onto the Night of Navy circle and then glued with Multipurpose Glue onto the Front of the Notepad Cover. I hope you've enjoyed my projects. Next up on this hop is my friend Megan Thompson and I know she'll have something awesome to share with you.. she always does! Just click the next button! In case you've lost your way, here is a list of all of our talented Bloggers..
13. Tina Riddle - You are here! Hi! Hope your week is getting off to a great start! 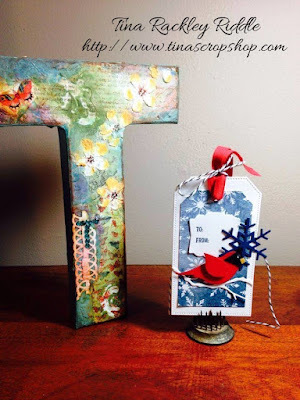 Today I started working on some Christmas tags and I thought I'd share two of them. 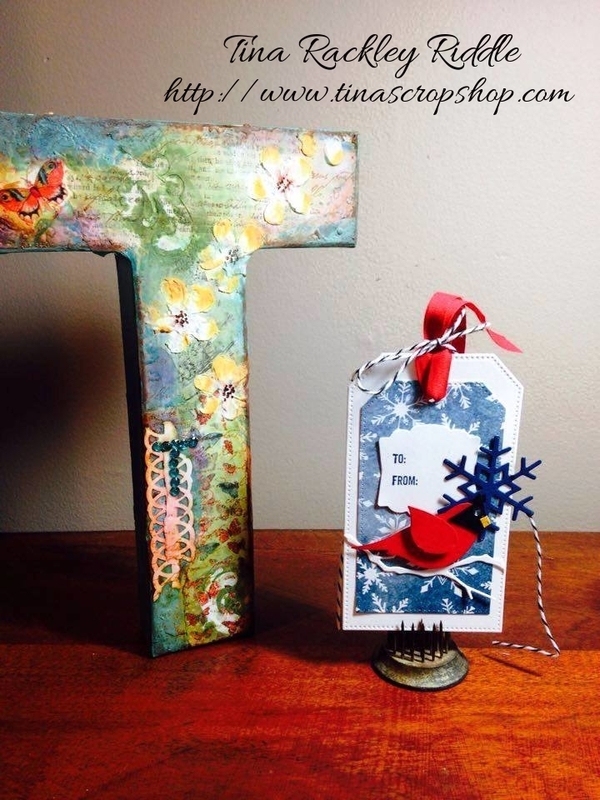 As an added bonus a sweet stamping friend sent me this awesome Mixed Media "T" for a gift in a Secret Santa Swap so I photographed my tags with my awesome new "T"! Both of these tags were super easy! 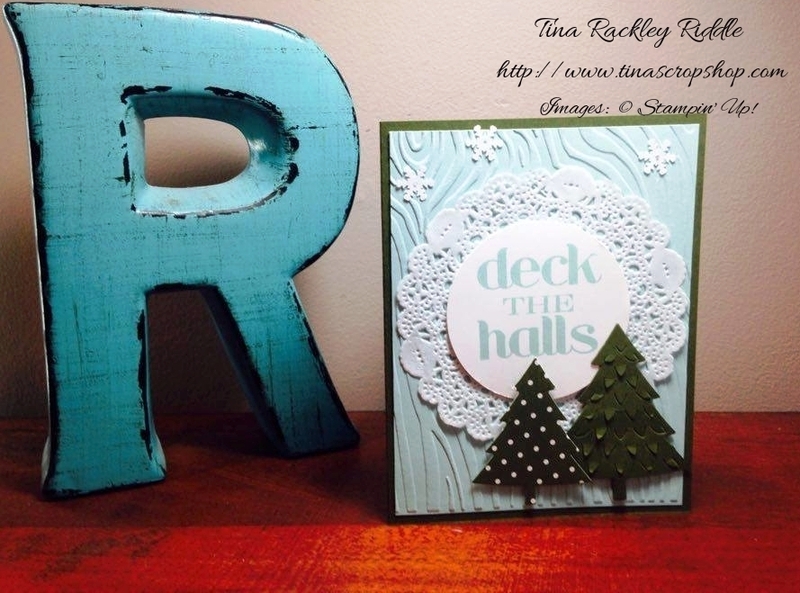 I used Thick Whisper White for my base and some of the Season of Cheer DSP layered over the white. I dressed up the first one with a Whisper White branch and a punch out Cardinal that I made with my Bird Builder Punch. I layered a To and From Punch and a snowflake to finish that one off. The second tag also used a Thick Whisper White base with another of the Season of Cheer DSP layers. I used my Perfect Pines framelits die to make my Christmas Tree and attached some of the Real Red Pom Pom Trim to the top along with 1/2" Real Red Cotton Ribbon and baker's twine. 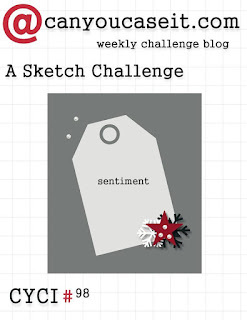 I hope that you'll take the time to make some tags this year! Here's my card using the Unity Stamp set Small Stuff Christmas! I just love this adorable little Charlie Brownish Christmas Tree! Hello and Happy Happy Friday! I hope you have had a fabulous week and will have an even better weekend! 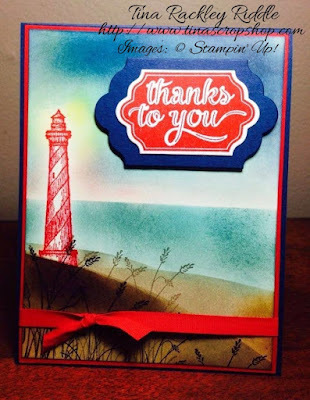 Today I'm sharing a card I made with the Flurry of Wishes stamp set. This beautiful set is thankfully being carried over along with the coordinating Snow Flurry Punch. I started off with an A2 card base of Wisteria Wonder. I'm beginning to love the look of skinny layers so my next layer was 5 3/8' x 4 1/8" of Pool Party. For the top layer I used Shimmery White Cardstock that had snowflakes from the Flurry of Wishes set heat embossed in White on it. After I had heat embossed, I sponged Wisteria Wonder, Pool Party and Soft Sky Ink onto it and then used a paper towel to wipe any ink off of the embossed snowflakes. Next I added a Wisteria Wonder and Pool Party Lots of Labels Framelits die cuts to the center. 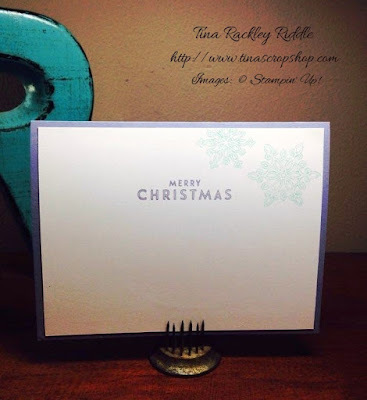 I stamped the sentiment from Flurry of Wishes onto Whisper White Cardstock and cut it out with the Note Tag Punch. I punched a hole in the end of it and added some lavender ribbon from my stash through the hole and then tied a thin blue ribbon in a bow onto the larger ribbon. I adhered the Sentiment tag with Dimensionals onto the Lots of Labels diecuts. 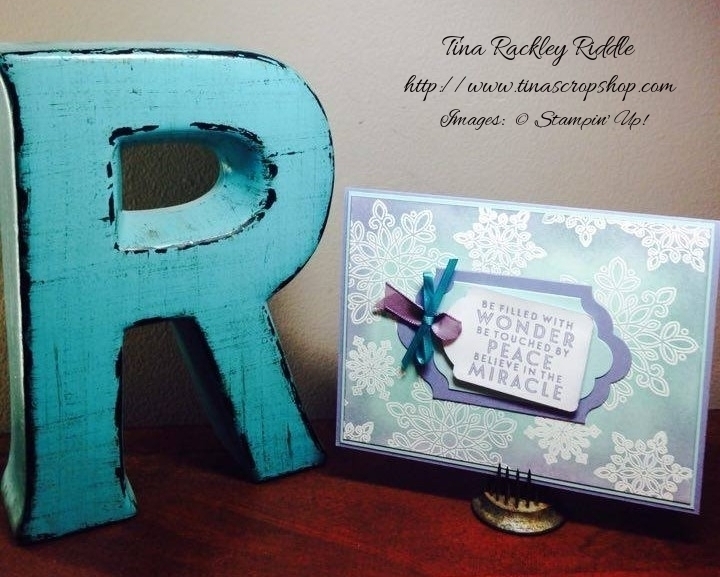 The inside was a piece of 5 1/4" x 4" of Whisper White. I stamped two of the snowflakes in the upper right corner with Pool Party that had been stamped off for a lighter image. The Merry Christmas sentiment was stamped in Wisteria Wonder. Hi all! I wanted to share these adorable magnets that I made for a recent craft fair. If you've been following my blog, you know that I LOVE the new Home for Christmas DSP. I've made various Christmas magnets before but I have to tell you this adorable DSP really makes these the cutest magnets ever! Here's a look at the finished project in my basket and ready to share some Home for Christmas love! The bag marbles that I used to make these was purchased at the Dollar Tree for yes, $1.00. I believe they are sold by weight and I didn't count how many were in the bag but I'm guessing the bag I used this time contained about 50 marbles that are approx. 1" in diameter and flat on one side. They are so super easy to make. With my 1" circle punch I punched out many circles with this fabulous DSP trying to make sure that the image that I want to be prominent on my magnets was in the center of the circles. Once I had all of my circles punched, I began gluing them to the flat side of the marbles using Crystal Effects. You'll want to use enough to make sure that the DSP is solidly glued on the marble and can use a paper towel to blot off any excess. 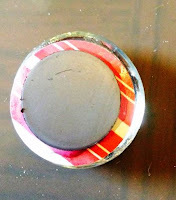 Once the DSP is glued and fairly dry, you will glue on your magnet disc. 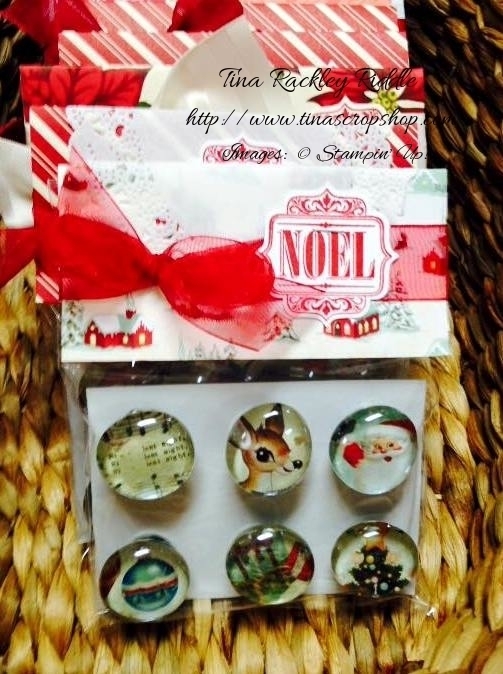 You can get a package of magnet discs at most craft stores or even in the craft department at your local Walmart. To package my magnets or a gift or for sale, I used a 3"x 4 1/2" piece of cardboard as my base.... I used the white piece of cardboard that is in the back of our DSP packs. For my packaging, I placed 6 metal washers on the cardboard in the place that I wanted my magnets attached. I drew a dot inside the center of the washers and then removed them and punched a hole in the circles by stacking two or three of these pieces together and punching with my Crop-a-dile. Once that the holes were punched. 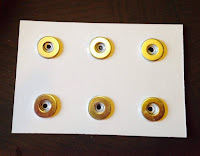 I glued the washers using Crystal Effects onto the cardboard. 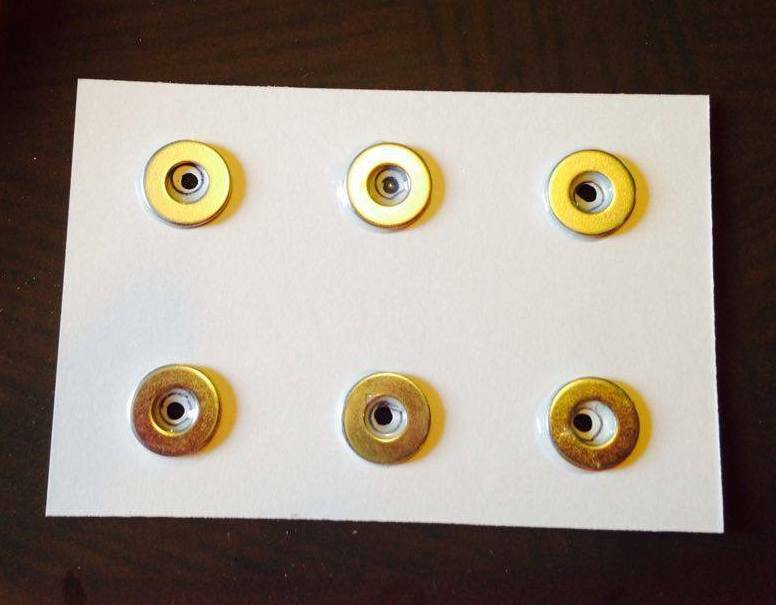 Once dry the magnets are ready to place on the washers to keep them in place. I used a clear 5 x 7" self-adhesive bag to package the magnets. 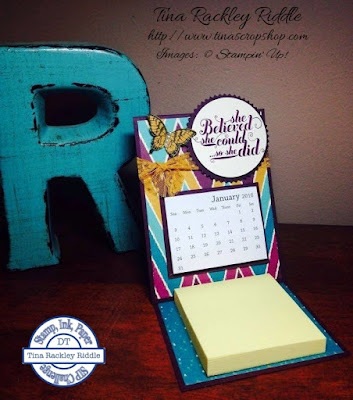 I made a topper with a coordinating DSP and attached with my Stampin' Up! Stapler (another product I LOVE!). I tied ribbon around the header and tied it making sure that I was covering the staples. I stamped the "Noel" Sentiment from the Antique Tags Stamp Set and punched it out with the Label Bracket Punch and attached to the Ribbon with Dimensionals. Super easy and really pretty. 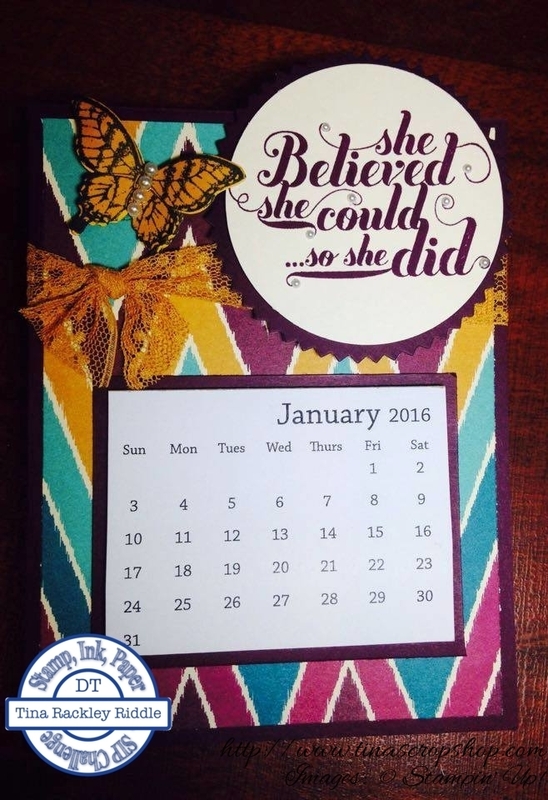 These make a fun gift for co-workers or friends that you want to give a little something to. I hope you'll try them! sure you hop all the way back through! I decided to make packaging for wine along with a card. You know packaging doesn't mean you can't see the gift, it can be something as simple as a beautiful wine tag and a big bow! I have a confession..... I absolutely adore the Home for Christmas Designer Series Paper and am thinking seriously about buying some extra to hoard! It has so many gorgeous patterns! 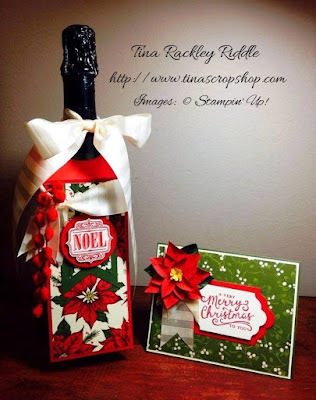 I used two of the patterns on the wine tag and another of the patterns on the card. Since all of the patterns had Real Red, Mossy Meadow, and Very Vanilla, they coordinated perfectly! 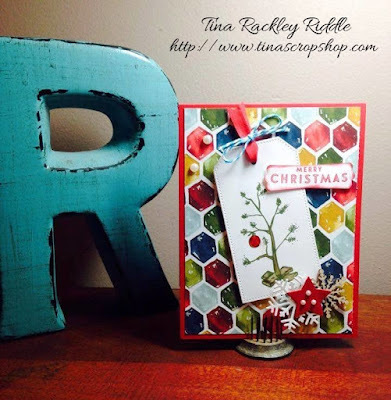 I also carried over the poinsettia theme from my wine tag to my card by using the awesome Reason for the Season Stamp Set and Festive Flower Builder Punch bundle! I love love love Bundles! Who wouldn't want to save 15%?! 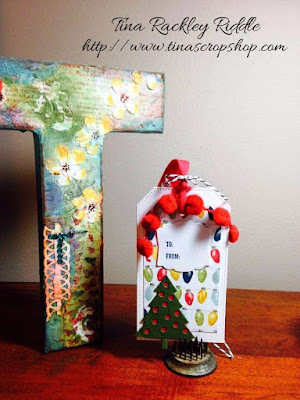 If you haven't made a wine tag before, they are super easy to make! I started with a piece of Real Red Cardstock that measured 10" x 3" and the 10" side was scored at 3 1/2". I used my 1 3/4" punch to punch out the hole for the bottle neck and rounded those corners. I added a piece of 2 3/4" x 6 1/4" DSP to the bottom portion. I cut banner ends on a piece of 2" wide Mossy Meadow Cardstock and a Piece of 1 1/2" wide coordinating DSP. I stamped the "Noel" sentiment form the Antique Tags Hostess Stamp Set in Real Red on Vanilla Cardstock. I used my Label Bracket Punch to punch it out and backed it with Dimensionals on a 2" Real Red Cardstock Circle. I added a piece of Very Vanilla Subtles Stripes 1 1/4" Satin Ribbon and knotted it on the left side of the wine tag and then ran a piece of Real Red Pom Pom Trim through it. After placing the wine tag on the wine, I added a bow onto the neck of the wine bottle in more of the Very Vanilla Subtles Stripes 1 1/4" Satin Ribbon. I think it was a beautiful presentation and would make a lovely gift for any wine lover! My card was an A2 Card base of Mossy Meadow. I added a layer of Very Vanilla that measured 5 3/8" x 4 1/8" and then a layer of DSP that measured 5 1/4" x 4". 3 pieces of the Very Vanilla Subtles Stripes 1 1/4" Satin Ribbon were attached to the upper right portion with Tear Tape. I stamped my Poinsettia Leaves from the Reason of the Season stamp set tone-on-tone using Real Red and Mossy Meadow Cardstock. After stamping all of my leaves I punched them out with the Festive Flower Builder Punch. The center of my Poinsettia was punched in Hello Honey cardstock. I used my bone folder to give the leaves some dimension before attaching to each other and finally to my card. The sentiment was also from the Reason for the Season Stamp Set and was stamped in Real Red Ink on Very Vanilla cardstock. I cut the sentiment out using my Lots of Labels Framelits Dies and cut a Real Red Label to mat the sentiment. The red mat label was glued onto my card with Multipurpose glue and the sentiment was attached using Dimensionals. Thanks so much for hopping along with us today! 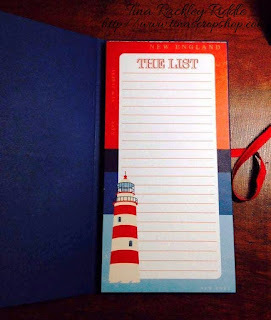 The next stop is Terri Takashige's awesome blog! 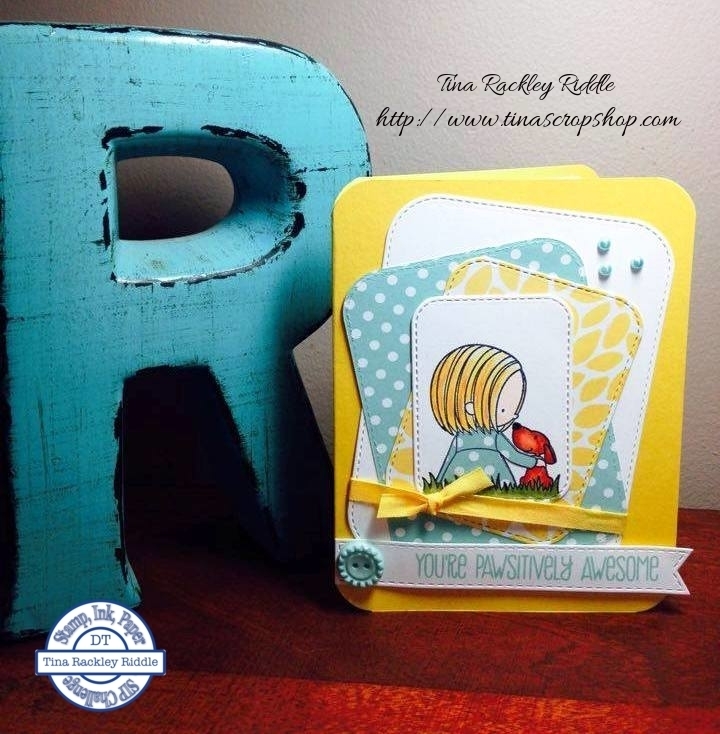 Terri always has such great projects! Just click the Next button and you'll be there! Hello and Happy Tuesday!!! I hope you had a fabulous weekend! I had a craft fair on Saturday that I took part in and had a great day with some great friends! That always makes for a wonderful weekend! 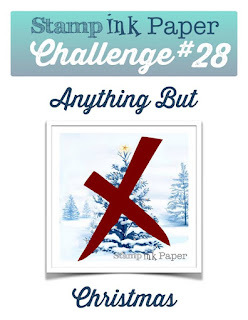 The Stamp, Ink, Paper challenge this week has me tickled pink.. yep, I'm a happy camper because it is a Cardmaker's Choice which means I can make whatever card I want to make! I hope you'll head over and link up a card of your own! I decided to make a card that is a triple treat! It's a card, a post-it note holder, and a calendar all in one! I sold quite a few of these at my craft fair and I had a few friends in the One Stamp At A Time Facebook group request instructions. I'm planning on doing another craft fair in 3 weeks so I thought it would be a great time to make a few more and blog the super easy instructions! I started out with a piece of 11" x 4 1/4" Blackberry Bliss cardstock that was scored at 2 3/4" and 5 1/2" so that it folds up like an easel. I added a piece of 4 1/4" x 5 1/2" Blackberry Bliss and attached it with multipurpose glue to the back section of the uppermost part of the easel card base. Here are two pictures that may be helpful with the fold and attachment of the 2nd piece of cardstock. I used lighter cardstock for the pictures so they would be a little easier to see. Once I had the 2nd piece of cardstock in place, I used 4" x 5 1/4" Bohemian DSP layers for the upper and bottom portion of the card. I attached my Post It Note Pad on the bottom with Tear Tape. 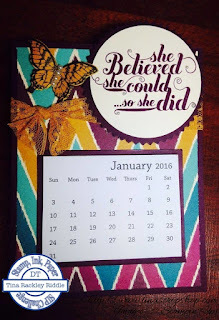 The 3 x 2 1/4"calendar on the upper portion was attached to 3 1/4" x 2 1/2" piece of Blackberry Bliss cardstock with tear tape and then attached with tear tape to my card. Delightful Dijon Dotted Lace Trim was tied across the upper portion and knotted on the left side. I stamped my sentiment from the Feel Goods stamp set in Blackberry Bliss Ink on Very Vanilla Cardstock and punched out with a 2" circle punch. I backed that with a piece of Blackberry Bliss cut out with one of the Starburst Framelits and attached it with Dimensionals onto my card over the lace. I stamped the Butterfly from the Papillion Potpourri Set with Memento Tuxedo Black Ink onto Delightful Dijon Cardstock and punched it out with the Elegant Butterfly Punch. I used my bone folder to curve the wings before attaching it with glue dots onto my card. I also attached some pearl jewels to the butterfly as well as some pearls to some of the curly ends of the letters. 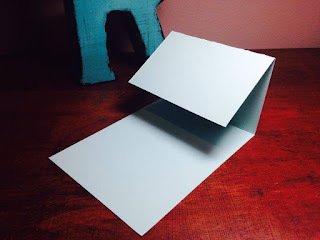 I love that this card folds flat and can be mailed!